(from page 2 of the 1967 Collection) Acapulco Blue 1967 Mustang which came originally with a 200hp (at 4400rpm), 289 cubic inch, V8 engine. This Mustang was made into a GT but has its original paint and interior seats. A 800 x 600 pixel desktop wallpaper is available for this car. (from page 2 of the 1967 Collection) Right front view of the Acapulco Blue 1967 Mustang. A 800 x 600 pixel desktop wallpaper is available for this view. 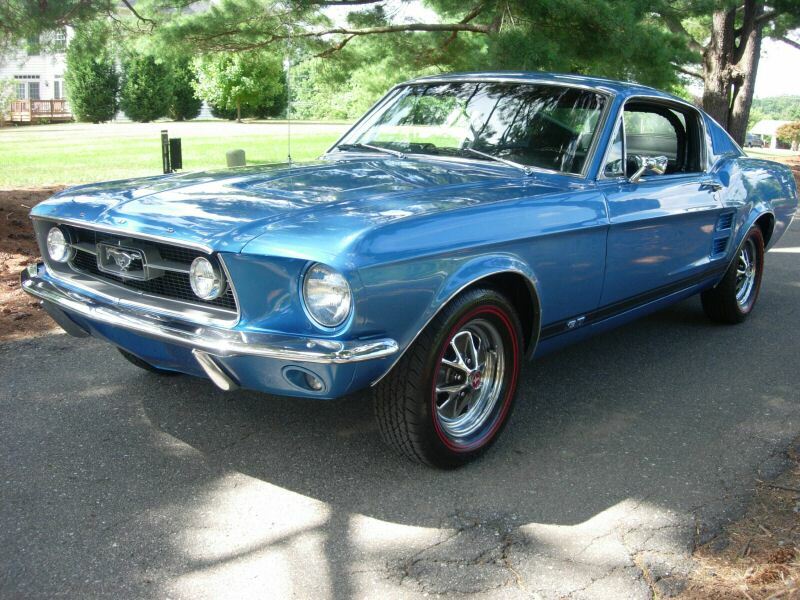 (from page 5 of the 1967 Collection) This 1967 Mustang Fastback is owned by Paul of Miramichi, New Brunswick, Canada. Paul says, "I bought the car in 1996 and stored it away for ten years. Took it out a few years ago and decided to strip the car down to the metal and paint it the original color and aligned the body up again. However, the car surprised me for the shape it was in; I had to do very little work to it. It's also a 4 speed car. I don't have much time to drive it because I run my own autobody shop. We all know what that's like. No time for our own. I'm also in the process of building another one; its also a 1967. I had that over 25 years now and no time to work on it as well. I also have a 1977 Cobra Mustang bought in 1996. It's a 4 speed as well." This is an S-code car with a 390ci, 4-barrel, V8 engine. (from page 6 of the 1967 Collection) Check out this amazingly restored Silver Frost 1967 Shelby GT350 Mustang fastback owned by Emmanuel Theux of Monte-Carlo, Monaco. There are several other darker gray 1967 Shelbys out there but this is the color and year that inspired the Eleanor Shelby used in the Nicolas Cage, 2000 movie Gone in 60 seconds which is also a light gray, but more accurately Eleanor Pepper Gray Dupont 44490. There is much confusion on what 1967 Shelby color code 6 for Medium Gray is. Marti confirmed with Emmanuel that over the years Ford color code M1901 Silver Frost had been mistaken for the correct Ford color code M1900 Thunderbird Charcoal Gray. 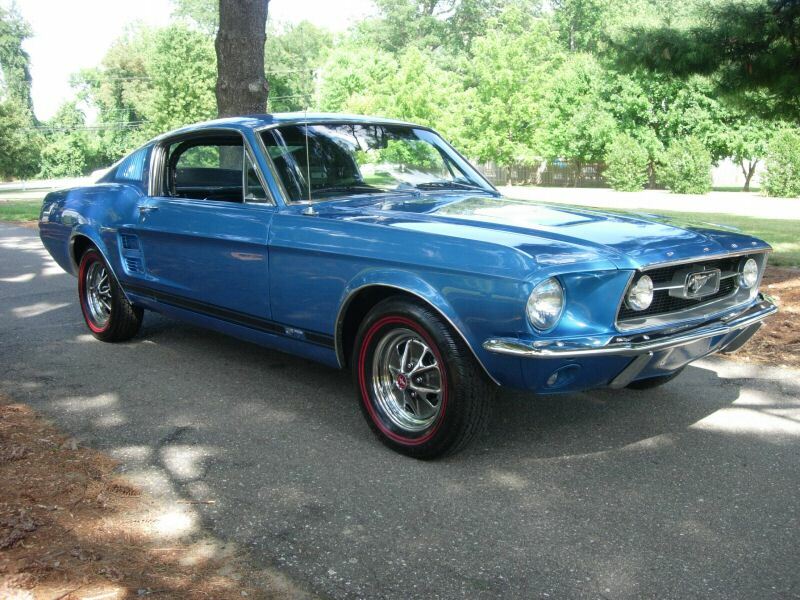 Emmanuel's 67 GT350 was our Attitude Of The Week for May 3rd, 2009. Emmanuel has owned many Mustangs. Check them out by clicking here. (from page 6 of the 1967 Collection) This car started off as a promotional car at radio station WHOO out of Orlando, Florida. It was sold to someone in California, then purchased in 2003 to be restored. Now Emmanuel has it in Monaco.